If you looking for teeth straightening or braces in the Liverpool street area ODL Dental Clinic is conveniently located close to Liverpool Street underground, offering high quality teeth straightening treatments (braces) and cosmetic dentistry. Adult braces have become very popular in the recent years as young professionals in the city are looking to improve their smile. We endeavor to provide you with the highest quality dentistry, using the most up-to-date skills and the latest and best technologies and materials available. Our peace-of-mind warranty for our teeth-straightening treatments guarantees that we will straighten your teeth or else we will refund your fees. At ODL we offer Pay-as-you-go braces and 4 different options depending on your needs. We use traditional metal braces, ceramic braces, lingual braces and Invisalign. Prices for adult braces in London varies from £450 for metal braces, £550 for ceramic braces and £800 for Lingual braces. Everyone wants a gorgeous smile. Not only do our teeth often have an impact on your personal life but can also make a significant difference professionally. While presentation has an increasing influence on our society, it’s no wonder Adult Braces North London are becoming more and more popular. Misaligned teeth are not just a cosmetic problem. Crooked teeth are often problematic not just for their appearance but also increase decay and gum disease as food becomes lodged and is hard to reach when brushing. Crooked teeth, in some cases, can even lead to headaches, jaw, problems with speech and neck strain. Strain on the mouth and jaw also increase the chances of broken teeth. Many adults now look to Adult Braces North London to improve their appearance, confidence and mouth hygiene. Where once there was a clear cut opinion that braces were not worn by adults, now, orthodontics and the latest technologies have allowed adults to have a subtle and more comfortable way of straightening their teeth. Most adult professionals who get braces explain that their friends are surprised at how unnoticeable they are and say that colleagues didn’t notice for weeks! The results of adult braces is nothing short of amazing. No more crooked teeth and no more shying away from the camera. Adult braces give you a perfect straight smile. So what are the options available to you? Well, there are a couple of different options depending on your needs. A traditional adult brace is no longer done with metal but a white ceramic that is made to blend with your teeth. Our invisible braces for adults are just that, made to look as clear and unnoticeable as possible. Lingual braces are completely hidden from the front of your teeth. For this type of brace we actually fit it to the back of the teeth, leaving the front completely free. Unless anyone is having a look inside your mouth, they will never be seen! The other option we have in adult braces is a brace called an invisalign, these adult braces are one piece of clear retainer which fits exactly on top of your teeth. 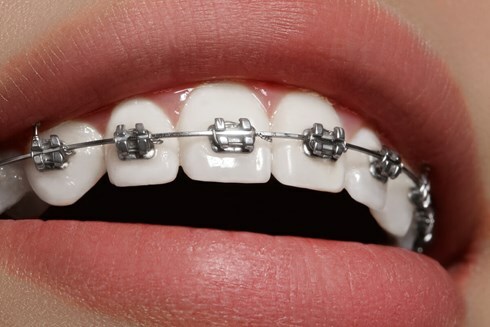 This is very popular with adults who are looking for braces as you are still able to take them out when you want to.